Alex Carson’s life has turned into a country song. He owes the government thousands of dollars in taxes courtesy of his fraudulent accountant; his wife, Connie, is bipolar; and his dog is dying. What he doesn’t realize is things are going to get much worse. During a visit to Alex’s wealthy brother Dave’s house, which Connie turns into a quest to get financial assistance, Connie causes Dave’s death after a heated argument. Alex decides that the only way out of this mess is to take Dave’s place and allow Connie to go establish an alibi, thereby avoiding the ordeal of having to fess up to the police about what had transpired. The execution of Alex’s creative solution makes for a crazy wild ride as we tag along in Alex’s first-person narrative. According to Annand, who agreed to talk with Val Tobin about his book, his use of the first person was designed to, among other things, oblige the reader to suffer in sympathy with Alex, no matter what morally questionable actions he had to follow through on. And suffer the reader does. Exquisitely. During this charade, Alex must share a bed with his beautiful sister-in-law, a woman stolen from Alex by Dave years before. He also must manoeuvre his way around Dave’s various existing relationships, including one with the housekeeper, with whom Dave may or may not have been having an affair. Following Alex on his adventures in Dave Land makes compelling enough reading, but the questions that arise about what was going on in Dave’s life at the time of his death compound the intrigue and the tension. When you also factor in the logistical issues with which Alex must contend, reading the story becomes an addiction. Annand, as always, has done his research to make everything in his novel authentic and credible. Dave suffered from Guillain-Barré Syndrome, something that Annand was familiar with from having an aunt who had the disease. Giving Dave GBS was a unique twist that makes things more demanding for Alex playing Dave, and of course, makes it more entertaining for the reader. Connie’s bipolar disorder certainly spices things up, but it also provides a glimpse of what it might be like to be married to someone who is bipolar. The most intriguing questions presented by the novel, and dealt with deftly by Annand, however, relate to Dave’s body and how Alex deals with it: How can Alex store the corpse? Where will he keep it? How can he obscure the time of death? How can he create a new, believable cause of death? Can he really pull it off? Should he really pull it off? The practical considerations run neck and neck with the ethical ones. Alan Annand has an uncanny knack for forcing the reader to read at breakneck speed to get past all the tense moments, while at the same time making him/her wish the ride would never end. 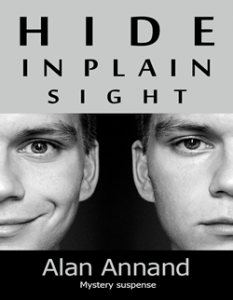 The first time you read Hide in Plain Sight, you will want to savour it, but it’ll be impossible. As the tension and questions mount, you can’t help but read as fast as possible to see what happens next. It is a most delightful form of torture. Don’t pick up this book if you’re looking for a bedtime-reading cure for insomnia. But if you’re looking for suspense, tension, and the queasiness that comes from participating in questionable activities, then this book is for you. This is the perfect book to take on a flight or on vacation. Alan Annand is a Vedic Astrologer and Palmist living in Toronto. He has published five novels and produced two children’s animations. He contributes articles to a variety of astrological magazines. Annand speaks at astrological conferences and New Age gatherings and has appeared on CBC and CTV. He was also a guest on several radio programs. Available for purchase from Smashwords and Amazon. Annand, Alan. Hide in Plain Sight Toronto: Sextile.com, 2011. Sextile (Accessed December 9, 2011).